Posted on February 9, 2010	by Lou Murray, Ph.D. 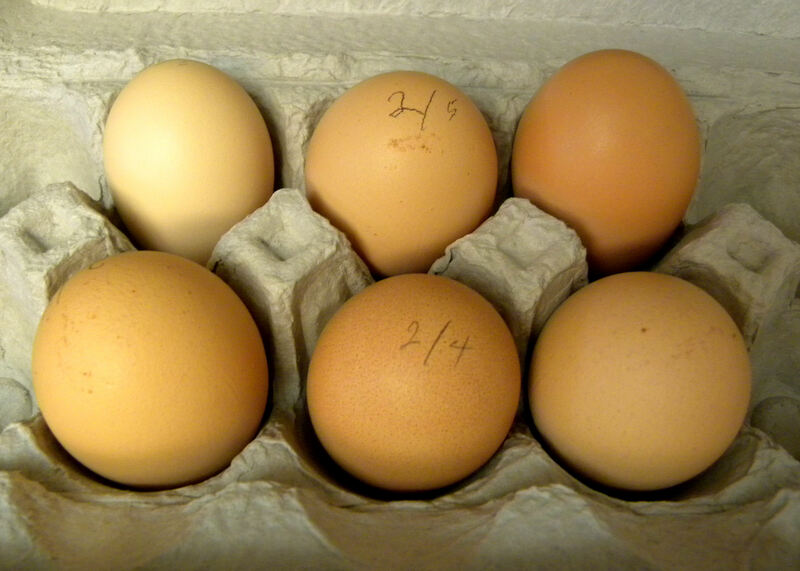 The first six eggs from our three new hens. Not a lot to report this past week for a harvest, except in the egg department. 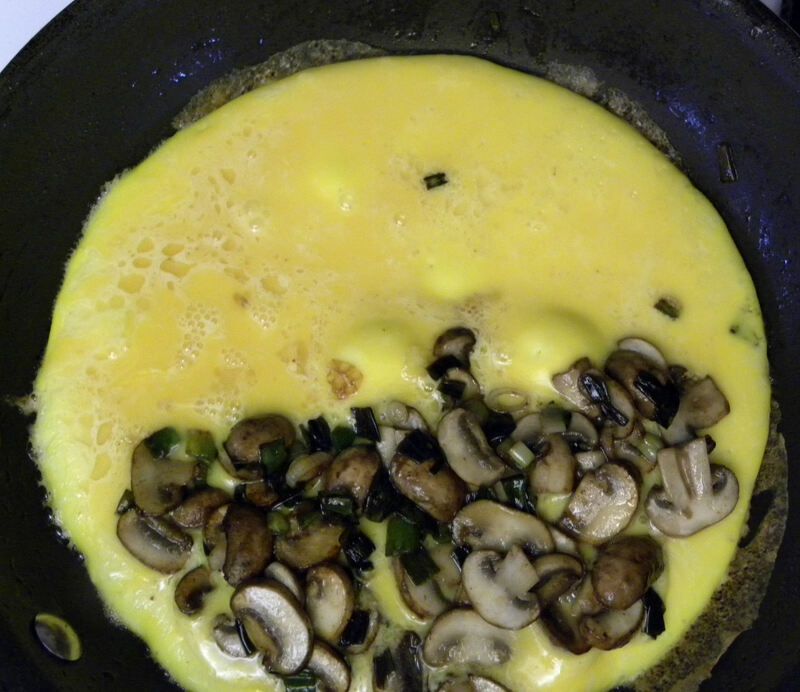 I sauteed the sliced green onions along with some crimini mushrooms for an omelette with four of the eggs. Our three new hens did themselves proud. We’ve used all of our store-bought eggs, and are now counting on our hens to provide eggs. After sauteing the vegetables, I set them aside. I added a T of milk to the four eggs, and beat them with a wire whisk. I poured the eggs into a hot skillet and put the lid on until the eggs were partially set. Then I added the vegetables, put the lid back on and finished cooking. At the end, I flipped the side with no vegetables over onto the other side, cut in half and served. 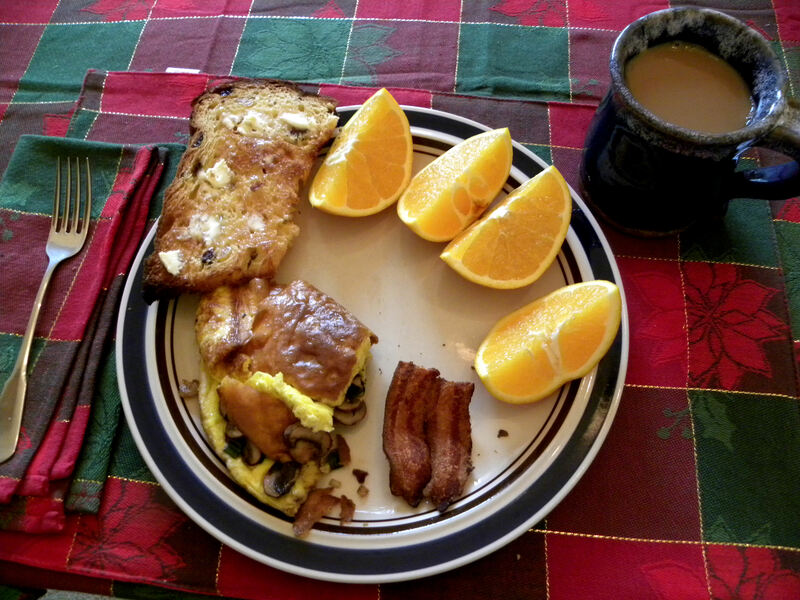 We had the omelette with toasted panetone bread, Niman Ranch bacon, and a navel orange apiece from our garden. It’s also planting time here in coastal southern California. I dug up the Garden of Infinite Neglect, at least the part that isn’t already growing beets, cabbage, collards, and kale. I transplanted allysum and Graffiti cauliflower (purple), and planted seeds of Bright Lights chard, Chioggia beets, Lutz green leaf beets, white stem baby bok choy, Seneca Butterbar yellow squash, and Monet yellow squash. The 2010 gardening season is well underway. I hope to get some more things planted in the morning (arg, which is only about 7 hours from now) before the rain starts up again in the afternoon. This 2010 garden year really does look like it’s going to be my best ever at this house. And that’s what I love about spring. The hope, the optimism, the belief that everything will grow and that the vegetables and flowers will look as pretty as they do in the catalogs. I feel like Linus in the Charlie Brown comic strip, hoping in vain for a visit by the Great Pumpkin. In my case, that symbolizes a great harvest. This year it could happen. 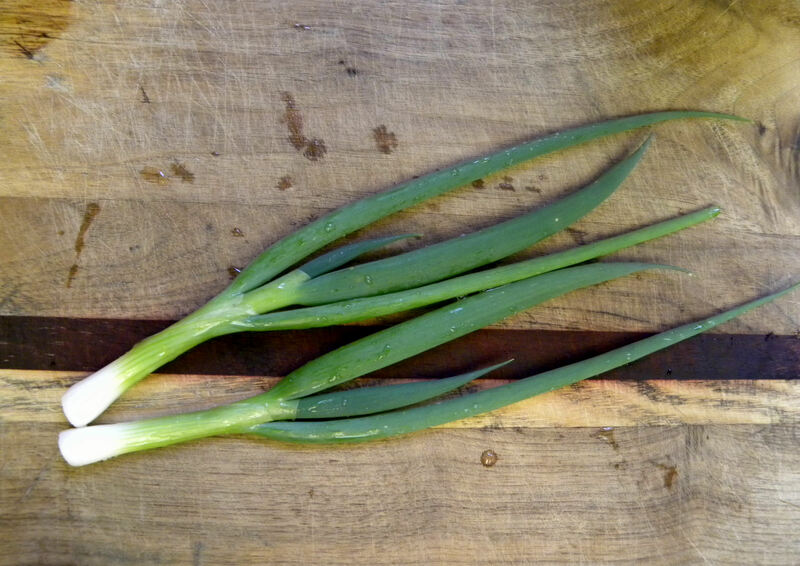 This entry was posted in Uncategorized and tagged backyard chickens, harvest, urban chickens, vegetable garden. Bookmark the permalink. I love your term “Garden of Infinite Neglect”. Mine is the garden of random neglect. Usually I take care of it well, but there is always someplace I haven’t. And on rare occasion it all gets neglected for a year. Congrats on your eggs. It must be exciting to get your first eggs. Hi Daphne, Yep, I’m like a little kid at Christmas with our hens. I’m constantly checking to see if they’ve laid an egg. Then I plot and scheme about what to do with them. I gave six away to my daughter-in-law yesterday, so we’re down to a mere three eggs. Get to work, hens! Wow more eggs, looks like Easter is well taken care of. I miss SoCal, the weather is so nice, one can garden year round. I started some seeds 10 days ago, don’t know about this year’s weather, it’s either snow or rain, we get 1-2 dry days a week, I haven’t been able to dig or prep for spring planting yet. Hi Mac. Spring weather can be so unpredictable. I’m trying to garden between rain storms. I’m about a third of the way through my list of spring chores, but another storm is here today. I got to get me some chickens (still not allowed at my urban location) as all these egg harvests are making me hungry. Nice decorative veggie selection you just sowed. Sorry you can’t have chickens where you live, Ottawa Gardener. I have to admit they’re noisy. But if people can have dogs in the city, they should be allowed to have chickens. My hens aren’t as noisy as the neighbors’ dogs. Hi Sharon. I have to confess that I haven’t tried growing tomatoes, peppers, or eggplant from seed before. My plan is to sow the seeds in 4-inch pots in a tray on the chicken coop roof. It’s the only spot in the yard that gets good sunlight in the winter. Temps next week are supposed to be in the high 70s, so I’m hoping for the best. Hi Lou…Do you start your tomato seeds indoors? I had pretty good luck last year starting them right in the garden with water bottle clotches to protect them. Also got a couple of pepper and eggplant seedlings started that way when it got warm enough.